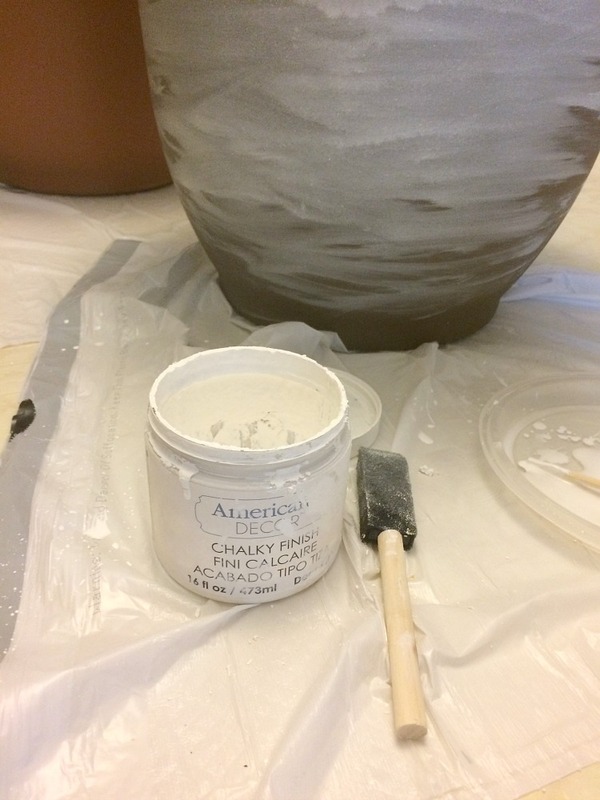 I received Americana Decor Chalky Finish paint in exchange for my review. This post contains Amazon affiliate links. 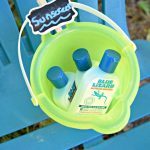 If you click on an affiliate link and make a purchase, I earn a small commission that helps me to run this blog – thanks! I am so happy that gardening season is here! 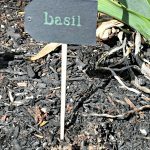 Carrie of Curly Crafty Mom and I are both sharing new posts for our summer gardening series! 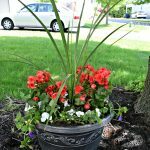 I’m showing how I white-washed inexpensive plastic pots for my backyard patio, and Carrie is sharing her newly decorated front porch for summer. Read on to the bottom of this post to see Carrie’s fun project! It makes me happy to play in the dirt and plant flowers! 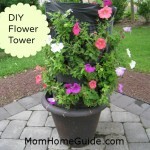 I’ve been researching how to add flowers to my home’s backyard patio. I finally found a simple way on Pinterest to add pretty but inexpensive pots to my patio, so I got to work earlier this week. 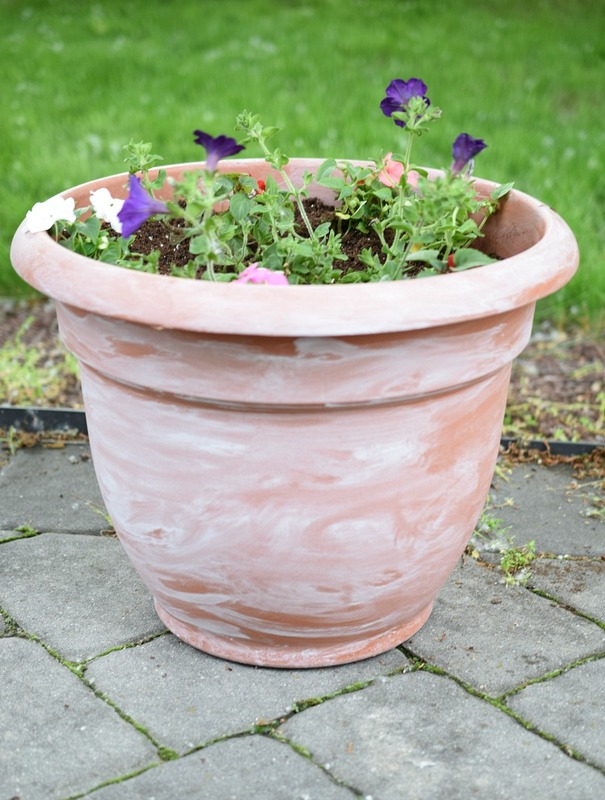 My inspiration is Cami at the blog, Tibits, who shared how to white-wash real terra cotta pots. I love how this easy technique mimics the look of aged real terra cotta pots. The pots I picked up are faux (plastic) terra pots, but the technique works well on both real and faux terra cotta pots. 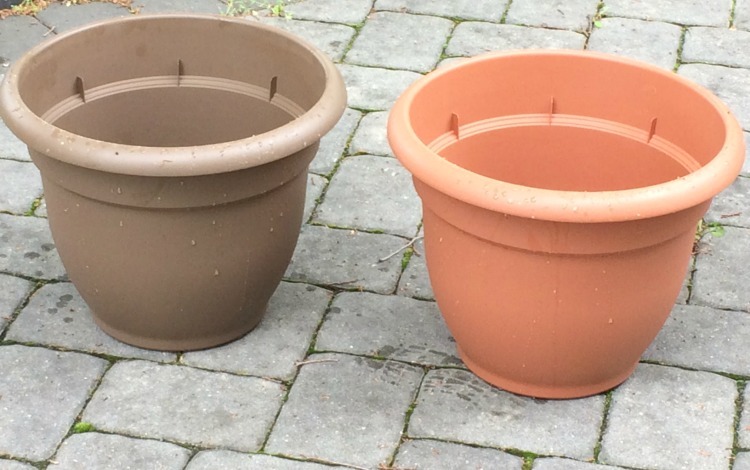 This is what the plastic faux terra cotta pots looked like before I painted them. To create my white wash, I simply mixed some white chalk paint with water to get a watery consistency. I applied the white wash to my pots with a foam brush. After I applied the white wash to the pots with my brush, I smeared the paint with a paper towel to give the wash a uniform, faded appearance. White washing the pots only took a few minutes — I think the white washed pots look great on my gray paver patio. 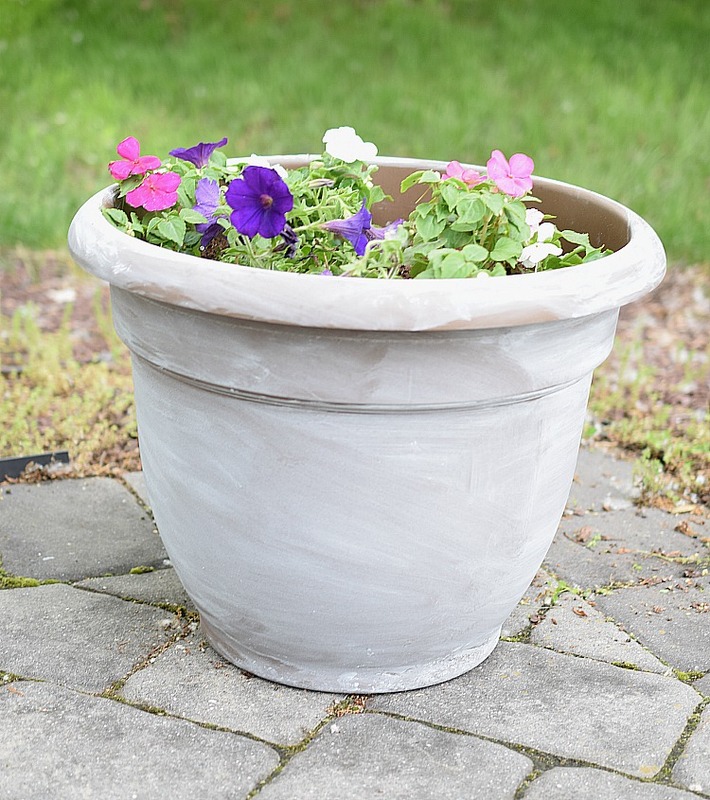 The below photo shows how the gray plastic pot turned out. You might have noticed in the above photos that there is moss growing in between the pavers of my western-facing paver patio. That moss drives me nuts and I’m always scraping it out! The moss is a sure sign that while my patio is at times sunny, it also gets some shade. Because the patio is shaded at times, I chose hardy annual flowers for my white washed flower planters that can take some shade — petunias (Proven Winners Supertunia Royal Velvet) and impatiens. I planted the annual flowers in a good potting soil mix. I am looking forward to seeing how my potted annual flowers will look in a few weeks! 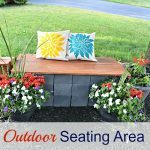 My friend Carrie at Curly Crafty Mom is also sharing a post about an updated summer outdoor space. 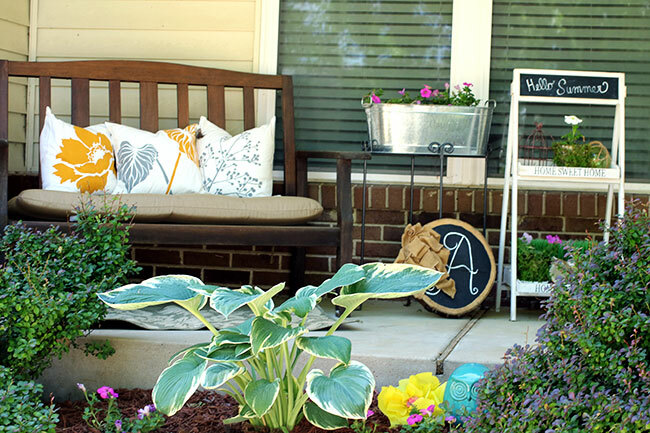 (Her adorable front porch.) Stop by to see her post! Those pots are adorable! 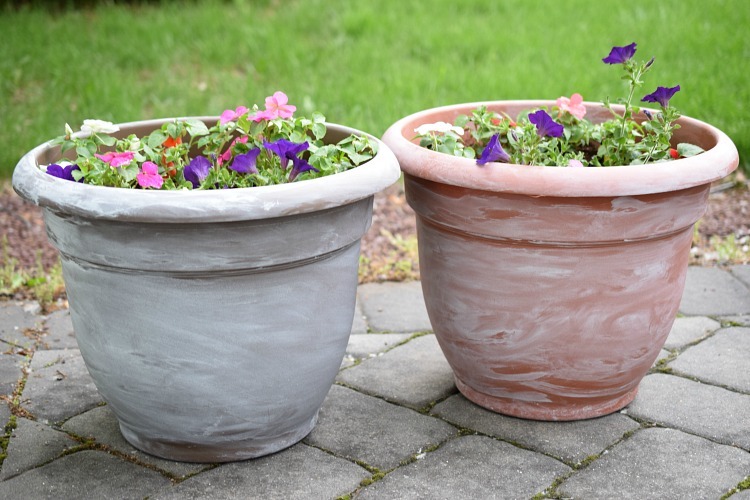 I want to do this to my two terra-cotta pots in my backyard now! 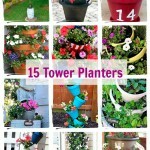 Perfect solution to dress up those pots! I have quite a few to transform this summer. Great tips! Hello Lauren, I am also happy that gardening season is here. It makes me happy to plant flowers. I love your gardening tips. It’s really helpful blog to me. Thanks for sharing such a nice blog. Love how simple this is to do and yet it add so mush character to the pot. very cite! !